This entry was posted in Art, Miscellaneous, Stationery by Tracy. Bookmark the permalink. 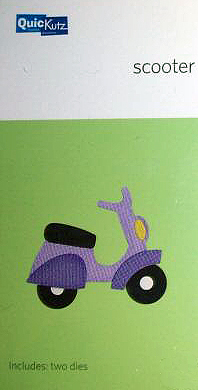 I saw an ebay seller from the UK who was selling die-cut scooter embellishments for scrapbooking. I assume she was using this system to make her embellishments so you could maybe have her make some custom colored ones for your scooter scrapbook! Thanks Vespa Belle! I think there’s a hand tool (non-electric) that isn’t tooo expensive but I will let everyone know as I figure it out myself. I got four scooter dies on eBay for like $3 so I can give you one. These can supposedly be used in a Sizzix Sidekick which is what I have. I haven’t tried QuickCutz dies in the Sidekick but it should work. 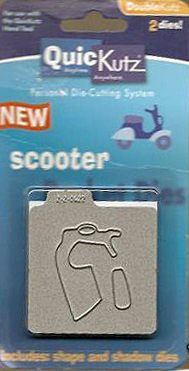 I’ll have to try to get one of these scooter dies to try it out.